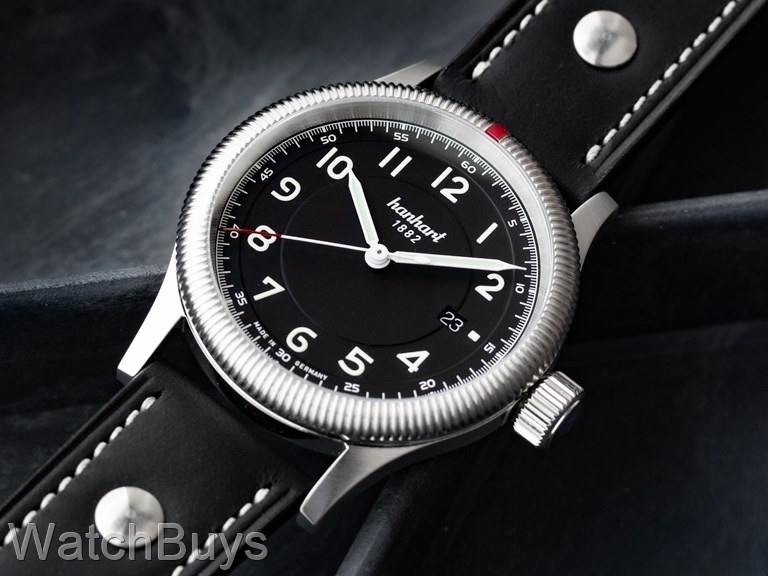 Hanhart is known for their chronograph watches, including flyback, single button and traditional two pusher chronographs. But with the new Pioneer One Series this German watchmaker has proven that great things can happen in the Black Forest in a non-chronograph design. Hanhart has released three new three handed watches to their Pioneer One Collection, one of which is a limited edition of 150 pieces with a special dial, SuperLuminova and case finish, with the other two as permanent (non-limited) additions to the collection which include this watch. The two non-limited edition watches are available in either a black or white dial and feature a date display. Click here to see this new watch in a white dial. These new Hanhart models fill an important role in the collection - three handed watches that are instantly recognizable as Hanhart watches without the chronograph functions. The new Hanhart Pioneer One Series watches offer a healthy dose of Hanhart history with a contemporary case size and other important design elements. For example, in choosing the hands, Hanhart revisited their 417 ES flyback chronograph series from the 1950's. The large crown was also important in early Hanhart designs, allowing the pilot to use the crown while wearing gloves, and that crown is fitted on this new series. This watch also takes design elements from the very famous Hanhart Calibres 40, 41 and 42 which were originally produced for the Air Force division of the German Federal Armed Forces. Although these earlier watches all featured chronograph functions, their designs became instantly recognizable as a Hanhart watch, and the new Pioneer One Series carries forward this tradition in a three handed time and date watch. Hanhart has chosen a perfect case size of 42 mm, and the fluted bi-directional rotating bezel with red marking is associated as one of Hanhart's most recognizable design elements. Verified Owner Comments: Love the watch. Looks great and comfortable to wear. Would like a different watch band, preferably a dark brown leather. Great find!